Happy snow day everyone! Two days this week Coquille saw some snow. Most of it was gone by noon or so, but if you got up early you might have been able to enjoy some of the glistening white landscape. 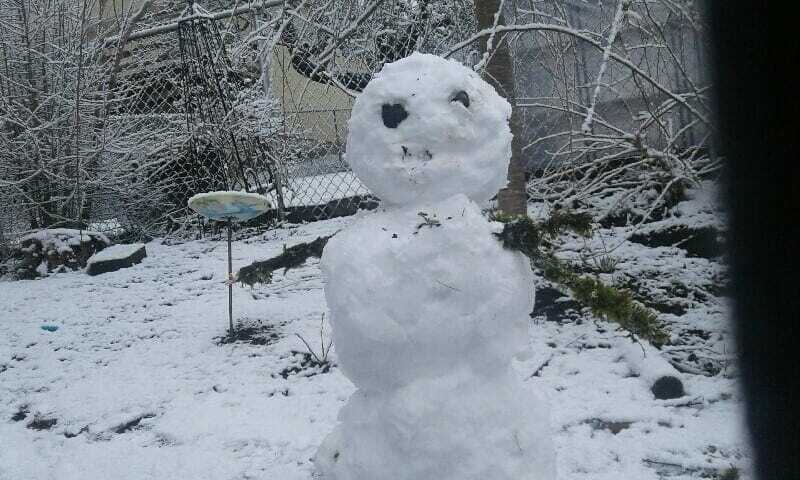 The above picture is of an early-morning snowman that my daughter and I made in our back yard. When it snows, everything is different. The landscape is covered in a blanket of white, the trees have little snowdrifts on every branch, and the world that was once so familiar seems different and strange. Our normal landmarks are buried, and houses and pathways that were once so well-known become changed. What we once knew like the back of our hand becomes suddenly new. The mundane becomes new again. Or, rather, it might be better to say that what seemed old and worn becomes renewed again. I think, in many ways, this is one of the ways that the Holy Spirit works in our life. The world around us doesn’t just become familiar, it becomes too familiar. Things that once surprised us and that we marveled over become just the normal and usual things one sees throughout the day. People, many of whom we love dearly, become just the usual folks we talk to. When we live with things too long, we begin to take them for granted. And much of the work of the Holy Spirit is not to just breathe new life into things in the world but to breathe new life into us, so that we don’t just see the world as the usual ho-hum place but, instead, that the world thrives and grows and shines forth the light of God. The Spirit renews us so that we may see the world for what it is: God’s Creation. May the Spirit always be with us, helping us see that the old and the familiar is still afire with the Light of God.